The Armarie Room is located in the Nelson Mail building at Founders Heritage Park, Nelson. Drop in during opening hours or get in touch to make an appointment. Only minutes from the centre of Nelson, The Armarie Room is located in Founders Heritage Park. Set within character buildings and displays of Nelson's heritage, the park hosts a wide range of artists and creative businesses. 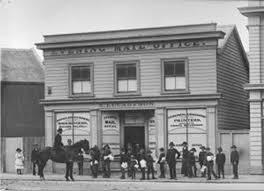 You'll find us in the Nelson Mail Building working alongside a public display that showcases the rich history of the newspaper and publishing industry in Nelson.